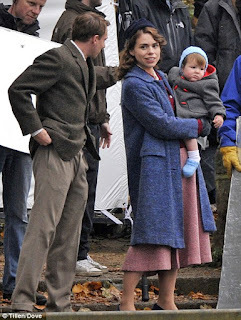 Went to the preview screening for A Passionate Woman last night; see Billie Piper above in full 50s garb. She wasn't there unfortunately, but a lot of Leeds faces were such as BBC Leeds presenter Christa Ackroyd, who did a Q & A session with Kay Mellor at the end. Nothing new really arose from that, she talked about more or less the same points as when I interviewed her. But to finally watch the programme was great and it massively exceeded my expectations. When it finished you could almost hear the whole room just sighing 'Wow'. We watched the first instalment, which focuses on Kay's mum Betty's young life, which is when Billie plays her. Her Leeds accent is faultless, and you just can't take your eyes off her whenever she's on screen. There are 2 instalments of 90mins each so can't wait to see the next one when it airs next month, Sue Johnston will play the older Betty in that one. It has a lot of humour and in a lot of ways it's so uplifting and inspiring, but it's also quite a depressing tale and it's just so sad to think of how unhappy Kay's mum was throughout her whole life. Imagine knowing your mum was so distraught at having the only man she ever loved snatched away from her, so continued in a loveless marriage with your dad and had children (including you) that were born from societal expectations rather than a loving relationship. Kay obviously had a very close relationship with her mum though, and Betty was incredibly devoted to her son too as is explored further in the next instalment. The thing that really strikes you about it all is how restrictive life was for women back in the post-war period, when they were forced to play happy families with whichever suitable man courted them and then asked for their hand in marriage. You got the feeling that turning down marriage proposals wasn't really the done thing. So many women must have felt totally trapped in that era; it made me wonder how many of them really did have affairs down at the local dance hall every week. Of course, it was pretty hard on the men who went out and worked such long hours too to provide for their partners. Just can't fathom being so dependent on a man though. Makes you very glad to be in the 21st century! Oh, and I must try and get into more of these BBC press events because I could definitely get used to gorging on endless complimentary red wine and canopees! Oh, also, Florida flights are now booked for 21st June, SOOO excited to be a big kid again! And will be exciting to show Jemell everything for the first time. Hulk, The Mummy, Space Mountain, ET, Jaws, Jurassic Park, Doctor Doom, Spiderman, Seaworld, Tower of Terror, pool, bbqs, pizza, Seinfeld, Walmart, Lucky Charms, all you can eat breakfast diners, TGI Fridays, here we come!